Been some time since my last blog post, and I have to be honest, I don’t really like writing. But either way, I’d like to share my latest goals / dreams of my life. Over the years, I had a chance to try out and learn many different sports, many that I still do and practice to get better at. 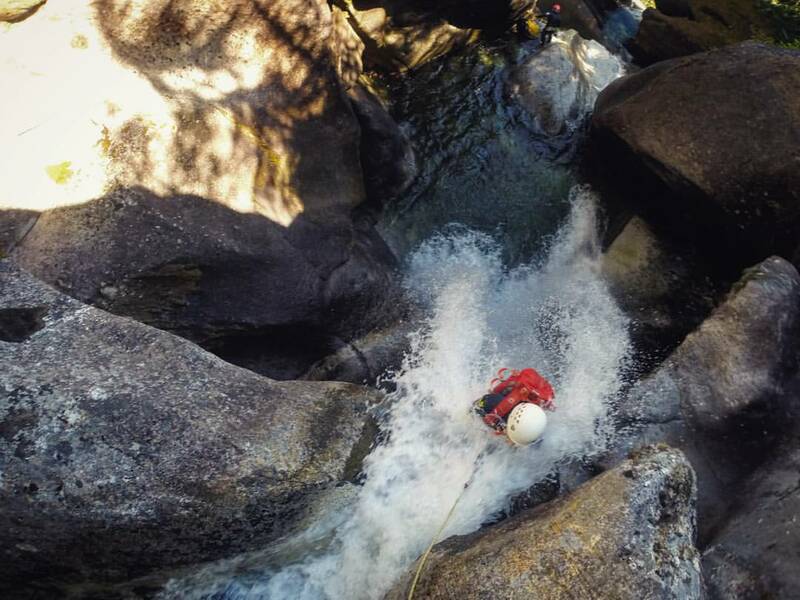 There’s still a few sports that I yet would like to add to my activity list: such as base jumping, white water kayaking, and hang gliding (and if I ever have the money for, learn to fly a helicopter). Lately I have realised that I have another passion: Photography. I have realised that passion after I broke my ankle from canyoneering. It gave me lots of free time to learn the essentials of photography, and over the past few months it has grown on me. My dream now is to be a professional photographer, and I would like to incorporate photography into all of the sports that I’m into. I would like to explore the world through many different means: air, land, and water… I still have many skills that I need to learn both in photography and in exploration skills, and still got lots of investments to make for the gear I need (my next one is going to be an underwater housing for my camera). This is going to be a long journey, but a worthy one! 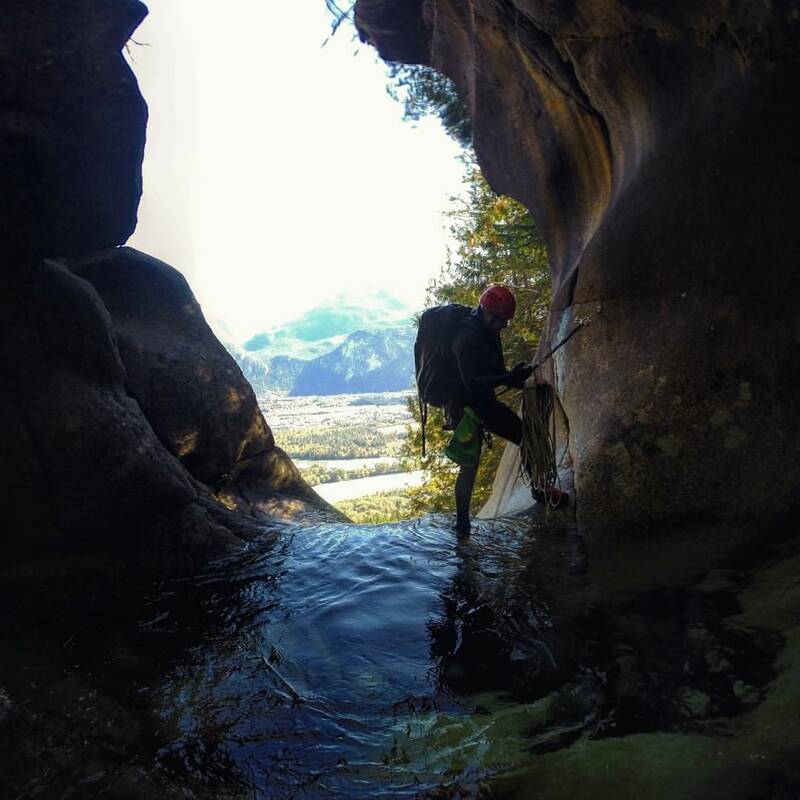 The day has started off really well, we got to Squamish early, got the gear ready, put on our wetsuits, and were ready to cross the river to reach Monmouth Canyon. The river crossing was fairly easy. We put all our bags into a cheap inflatable boat, and we swam beside it, letting the current of the river take us 1 km downstream where the trail to the top of the canyon began. The hike up was steep and fun! Definitely not a place one would want to be falling from! Once we got to the top, we took a quick break to get organized, had a few bites to eat, and commenced our way down the canyon! The Monmouth Canyon is a beautiful place! Most of spots like these are hidden from a normal day to day person, so it feels amazing to be able to go explore them! 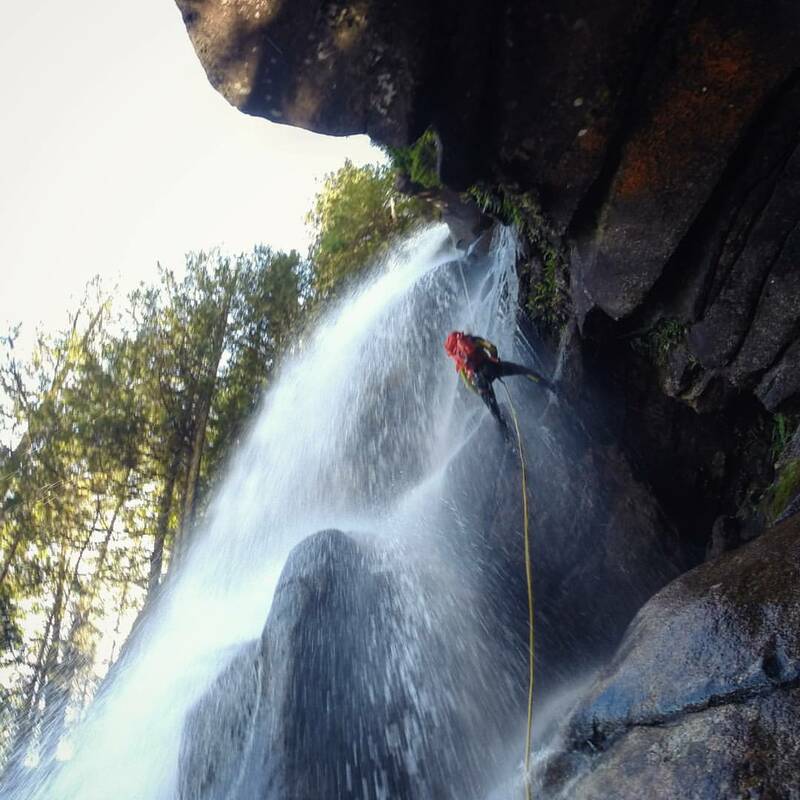 We rappelled many different waterfalls, some involved cliff jumping, some sliding and jumping. The water was freezing, so even with our wetsuits we were always trying to stay moving to keep warm. The day was amazing, until on one of the rappels, I have slipped, hit the wall, and let go off my “break” which led me flying down 15 feet onto the rock bottom. Right away I felt something was wrong with my foot. I looked at it and it was dangling sideways. Right away I knew it was screwed, I thought maybe I have just dislocated it, and I tried to ‘pop’ it back together with no success. So now, the challenge was to get out. I didn’t want to waste much time, so I crawled out of the canyon, with help of my friends found a stick, and slowly was making my way down the mountain. Meanwhile my friend got a hold of search and rescue, once we found the most suitable spot for helicopter extraction (there wasn’t much), we called in our coordinates and waited for search & rescue to arrive. It took over 2 hours for search & rescue to figure out how to extract me due to the difficult location. Meanwhile I was slowly going under a mild hyperthermia. I was contemplating just to make my way down myself while I was still somewhat able to before the sun went down. But before that happened we were notified that the search & rescue have found a spot to extract us and are sending help our way. When they have arrived and stabilised my foot, I felt all the energy came back to me and I felt super excited to get rescued! The helicopter ride was awesome! And perhaps was the only upside of having broken my ankle. I want to thank the search and rescue team for rescuing me, and also to my friends and team members that helped me get out of the canyon safely! Out in the Squamish Hospital, they took good care of me quickly. They have had to reposition my foot before putting a temporary cast before I get my surgery, so they put me in a semi-conscious state that made me go on a super awesome mental trip! The next day I was moved to Surrey Memorial Hospital where I waited 4 days until my surgery, I didn’t enjoy the waiting part so much, I would have had to wait more but luckily I had a nurse friend that was able to pull a few strings to get me in a little quicker. Thanks for that! Here’s a couple videos from that day. One has made the Right this Minute internet show, (my second time getting on that show lol). Here’s the link. Last weekend we had a wind storm that took out power from half of the city for a couple of days. A handful of windsurfing enthusiast were racing towards Centennial Beach to catch some of that craziness. I had to take the long way thru the city to stop at a store and pick up a special fin for my board before going to the beach. It was craziness driving thru the streets, debris was flying everywhere, lights were not working, branches falling everywhere. Most of the people were driving way too slow and cautiously, while some people like myself, where very inpatient. I avoided getting into 3 accidents during that drive. After all that, I unfortunately didn’t make it in time and got to the beach when the wind started to drop… I did however redeemed myself with a good windsurfing session on Monday evening after-work! So lately, as the summer days are slowly coming to an end, I have been trying to do more scuba diving. I got an unlimited 6 months rental package from a scuba shop, so got to make it worth it! Most of my dives lately have been solo dives, my previous diving buddy has returned to his home country and it is hard to find a good buddy to dive with that has similar experience. So I stick to solo diving, which isn’t as fun and as safe as going with someone, but it does however pushes me to be much more efficient with gear management. I feel that I have gotten much better at it lately from not receiving any help from a partner. Some dives however I get nervous going by myself, the last dive I did it at night at a site I wasn’t familiar with. It was a dive after training and I didn’t felt very well that day and I felt nervous doing it. But everything went fine. Another area I have been spending time in is Lynn Valley. It’s a great area to cliff jump, but I became more interested in freediving there and exploring the underwater pools. One of my adventure friends became keen on doing underwater exploration with me, and joined me a few times… which is great, I felt much safer knowing that I have someone looking after me in case something happens. It’s amazing exploring the underwater of canyons, especially during the night! Being underwater in spots like that is like being in a different world! Training is going good, I don’t put as much time into training as I’m busy with other summer activities, but still pushing myself hard when I do. I have also started training someone kickboxing, he is a good guy and I enjoy training him since he puts 100% of effort every time he trains with me and enjoys pushing the limits. That’s what I really appreciate in people, is the effort. Motivates me to train even harder when I’m there! Other than that, I have decided to be very conservative with money. Over the years of adventuring, I have got myself into a dept. And I feel like It takes away from my freedom of adventuring even farther. So over the next couple of years I will only focus on the sports where I already have my own gear, and be smart with money. This will hopefully allow me to take adventuring to the next level in the future!